Madness, pandemonium and chaos is happening behind the scenes. Not that you’d know it from the frequency of updates to this space. Last week I launched a pretty neat new feature for the mic database: it now generates blocks of HTML that users can copy and paste onto their own sites to show microphone profiles elsewhere. 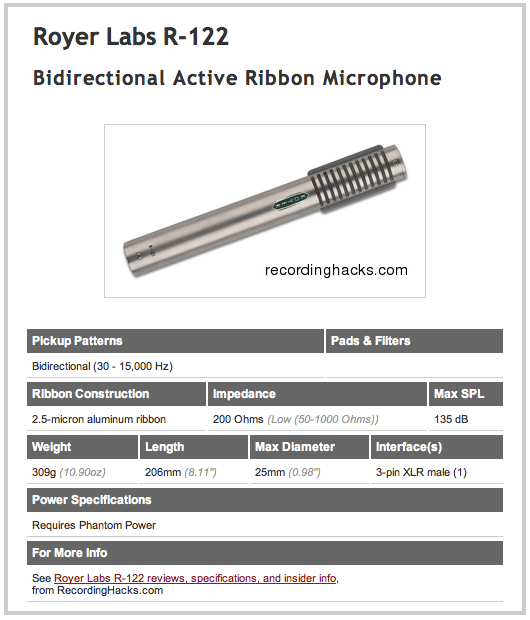 I can imagine this might be most useful for people selling mics. Rather than go look up specs on the vendor’s site to paste piece-by-piece into, say, an Ebay auction, grab this block instead. With a single copy/paste you get a big photo, nicely-formatted specs, and a link to the full mic profile. This will shave at least 7 seconds off the time it usually takes to set up a microphone auction. Cool, eh? To see how this works, navigate to any microphone profile, e.g. the Shure SM57, which I mention because I spent about four hours rewriting it over the weekend, and click the link in the right sidebar under “I’m selling one.” That should show a page where you can preview the specification block and copy the source HTML.